Inspiring a deep faith, innovative mind and caring heart through Christ. "St. Serra Catholic built my foundation for success in high school and the rest of my life. With St. Serra’s dedication to religion and prayer, I was able to develop my faith and dedication to God. St. Serra’s supportive teachers and challenging classes prepared me for all the academic challenges in high school. The community of St. Serra is warm and supportive and I always felt like part of a family when I went there. St. Serra was the perfect place for me to grow up and develop my confidence for the future." that my nine years here at St. Serra Catholic would be adventurous and amazing. The teachers here are so supportive and don't judge you if you get a question wrong. The kids are all so nice here, too. I met my true best friends here, and I've had them since Kindergarten and First Grade. I also know more about my religion - something that public schools don't offer. St. Serra helps you prepare for the future, and I feel confident that they did just that for me. So whether it's a tough time or a joyous celebration, St. Serra will encourage you to just be yourself and enjoy life, even if you have a ton of homework on your hands. As we say here at St. Serra, 'Siempre Adelante.' "
"We've always believed that the most important years in a child's development are the earlier years. We can't think of a better place than starting here at Serra Catholic School and getting that foundation of faith, love and security... You work so hard to do the right thing at home and to have it re-enforced at Serra is like an extension of home. You just feel good going off to work knowing your son or daughter is really being taken care of." A big school means building the confidence to tackle life in a big world. Our large and diverse student body offers the opportunity for students to make friends from a variety of backgrounds and cultures. Whether your child enjoys the arts, excels in athletics, or is a budding scientist, there is something and someone for every student to connect with at St. Junipero Serra Catholic School. 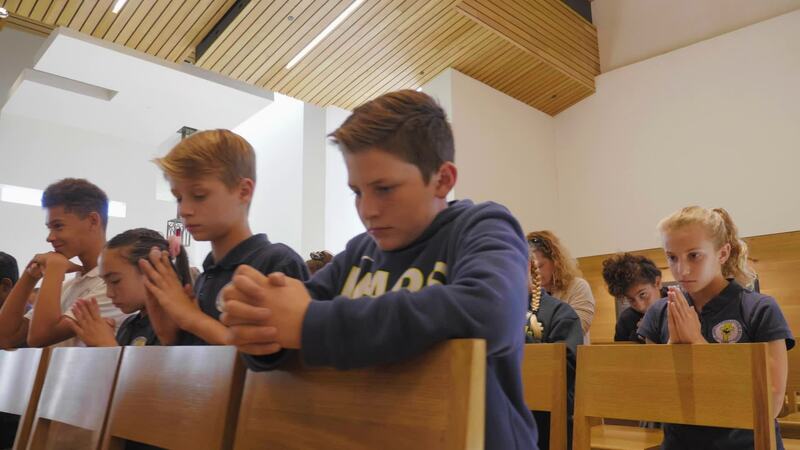 At St. Junipero Serra Catholic School we pride ourselves on our “small school” sense of community and caring environment. The size of our school doesn’t inhibit personal interaction - it encourages it. Although our student body is large, so is our staff - ensuring that individualized instruction and attention to students are at the center of our school. become servant leaders in their communities and throughout their lives. Strong Faith. Strong Minds. Strong Hearts. We are Serra Strong. CONGRATULATIONS TO OUR STUDENTS RECOGNIZED BY RANCHO SANTA MARGARITA! Ethan D. and Kyle B. recognized for academic excellence! Read more about CONGRATULATIONS TO OUR STUDENTS RECOGNIZED BY RANCHO SANTA MARGARITA! More Info about HAPPY Easter! Thursday, April 18 at 1:00 p.m and reopen Monday, April 29 at 7:00 a.m.
May the miracle of Christ’s resurrection fill our hearts with love, hope, and JOY.